TWENTY-one suspects have been arrested over the Plateau State killings, according to the special military task force Operation Safe Haven (OPSH). Among them are those found with arms and suspected hoodlums who hijacked the protests sparked by the killings. The special task force comprises police, Air Force, Army and paramilitary security agencies. 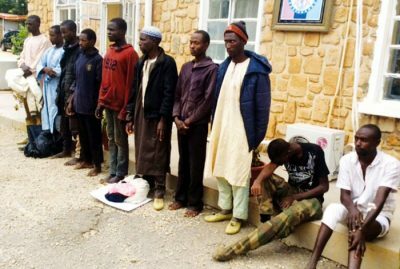 The suspects were paraded yesterday at the OPSH Headquarters in Jos by the media officer of the task force, Major Adam Umar and Police Public Relations Officer Tyopev Terna. Major Umar said: “Out of the 21 suspects we arrested so far, 11 of them are those arrested in connection to the killings in Barkin Ladi and environs while 14 of them were arrested from the scene of the civil disturbances after the attacks. He added: “In our efforts to fish out the criminals carrying out attacks in some villages in the state, particularly in Barkin Ladi, we have been able to arrest some people from the scene of attacks. “The suspects we are parading were arrested with arms, some of them with locally made guns, revolver and other dangerous weapons which they are not supposed to have as citizens. “Information we extracted from the original suspects led us to trace some other accomplices and we have also arrested them. And there is the possibility of making more arrests over those killings as we intensify our efforts to get to the root of these killings in pursuant of our mandate to stop the killings, prevent further killings and restore total peace in the state. “In our commitment and desire not to give the attackers opportunity to operate or opportunity to escape after attack, the commander of OPSH has relocated to Barkin Ladi based on his resolve to remain with the villagers and monitor things closely and to be able to respond faster to distress calls from residents in danger. Most of the suspects paraded have blood stains on their dresses. One of the suspects wore military trousers. Some victims alleged that some of the assailants were dressed in military uniform. The task force did not however disclose the names of the suspects. On June 24, the Government of Plateau, imposed a 6 p.m. to 6 a.m. curfew in Jos to avert a further breakdown of law and order, following the killing of scores of people in some communities. The downward review of the curfew was announced in a statement yesterday by Secretary to the State Government Rufus Bature. “The period of curfew earlier imposed on Jos South, Riyom and Barkin Ladi Local Government Areass has been reviewed. “The period of the curfew is now 10pm to 6am daily,” Bature said.